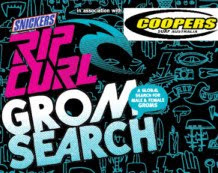 The Rip Curl Gromsearch heads to Coffs Oct 14th - 17th. In the U16's we have Tom Snellgrove, Shannon Mackie and Nik Hoskin. Mikey Wright is in the U14's. Zac Wightman and Jake Snellgrove are in the U12's. Good luck groms. In the U12's both Jake and Zac had crap heats and were relegated to the requalifying round. Both groms had better luck later and won their heats to progress thru to requal. round 2 so everything is back on track. Tom Snellgrove is thru to round 2 where Nik Hoskin is seeded and waiting for his heat tomorrow, Shannon was eliminated. In the U12's today Jake Snellgrove finished in 9th and Zac Wightman came 11th. Nik Hoskin progressed thru to round 3 in the U16's today but unfortunately Tommy Snell went down. In the U14's Mikey Wright had a good win and is into round 3. Congratulations to Mikey Wright finishing 2nd in the U14's in Coffs today. Nik Hoskin finished up in the quarter finals of the U16's.